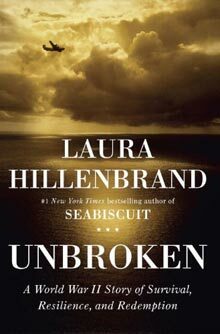 History buffs as well as those who enjoy a story that makes one grateful for the grace of freedom and family will love Unbroken. I read this book on the recommendation of my brother, who reads a lot of non-fiction and is a history lover like me. As a rule, I stick mostly to fiction during the few hours I allot to recreational reading, but I’m so very glad I invested my time in this amazing story. This book follows Louis Zamperini through his delinquent teens, to an unlikely passion that led him to participate in the 1938 Olympics in Berlin and ultimately to his service as an army airman during WWII. Zamperini was a survivor of a crashed aircraft in the Pacific, ending up on a tiny raft in shark infested waters, enduring only by resolve and ingenuity. And that’s only the beginning of Louis’s brutal journey. This book makes you thankful not to have walked in his shoes, while making you hope that if faced with a similar situation, you could maintain a tenth of Louis’s strength, humor and iron will. I was humbled beyond words.